The WBC Board of Governors has voted unanimously to order an interim title in the heavyweight division under the WBC rules and regulations guidelines and protocols. Dominique Breazeale, with a record of 20-1, became the mandatory contender of the WBC Heavyweight division in November 2017. Breazeale, in an exemplary action, accepted the WBC’s ruling to support the efforts to potentially finalize the fight between Wilder and Joshua throughout 2018 as well as accepting the WBC sanctioning of a voluntary defense of champion Wilder vs Tyson Fury which took place on December 2018. The WBC’s ruling during the annual convention addressed the Wilder vs Fury match, the potential Wilder vs Joshua match as well as the status of the mandatory obligations of the division. After the sensational fight between Wilder and Fury, the very close, high level fight which was scored a draw and by the popular demand, the WBC accepted to rule a direct rematch. 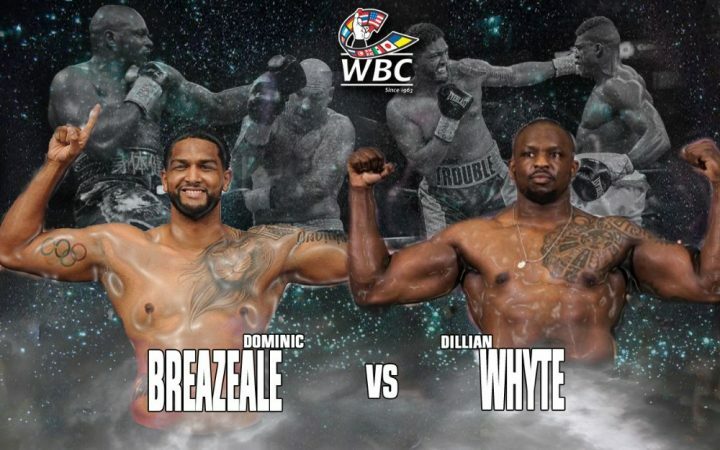 In order to provide activity to the heavyweight division and address the rights of Breazeale as mandatory challenger , the WBC is ordering a fight for the interim championship. Dillian Whyte is the current Silver Champion and has defended with success his championship 3 times in 2018. A former WBC International champion with a record of 25-1 who has expressed “ I know that the road to the Gold is the Silver, Im a proud WBC Silver champion”. The WBC is celebrating its 56th Anniversary and will continue to work and mediate to try to make the best fights for the fans of the world and we are extremely proud to see the tremendous excitement that exists in the heavyweight division all over the world. The free negotiations period has begun and if there is no agreement between the parties, the WBC will conduct a purse bid in Mexico City headquarters on Tuesday march 19 2019.